Supergirl’s last ongoing series hurrah prior to her final (well, as final as things usually get in comics) fate in the Crisis on Infinite Earths event mini-series that would appear just a few years later. 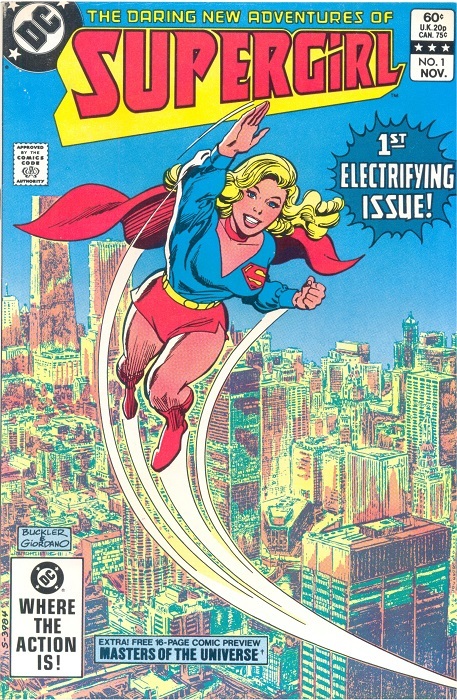 This Supergirl series featured the artwork of Carmine Infantino, best known for his work on The Flash and Batman , and would later introduce the short-lived very-1980s costume redesign with the headband. The “Daring New Adventures of…” part of the title would also disappear during the later part of this comic’s short life, wrapping up with issue #23. If memory serves, a new ongoing starring Supergirl and Superboy in their own adventures was planned after the end of this series, but the aforementioned Crisis on Infinite Earths would have put the kibosh on that, if such a thing was actually in the works. The Daring New Adventures of Supergirl series was notable for also having solo Lois Lane stories as back-ups in several issues. Issues 1 through 12 have been reprinted recently in a trade paperback (but not with the Lois Lane stories, alas). And of course, several years and reboots/revamps after that Crisis series, Supergirl has returned to the stands in one form or another, and is currently on the shelves in a new title as part of DC’s “Rebirth” publishing initiative, with a comic that more closely reflects the popular new TV show. This entry was posted in Back Issue of the Week on September 30, 2016 by Mike.